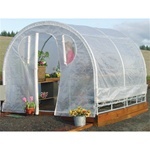 Backyard Greenhouse Kits | Free Shipping & Handling! Our backyard greenhouse kits are designed for DIY installation. Don't waste money paying a contractor to build your backyard greenhouse. Build it yourself with a backyard greenhouse kit like the ones shown here! Home Products 'N' More offers many sizes, styles, and configurations at a variety of price points so that every home gardener can find something to meet their needs. 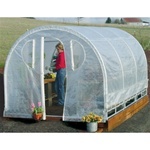 Best of all, you'll get free shipping and handling on all the backyard greenhouse kits you see here! Did you know that we also offer a variety of accessories for the Snap & Grow series shown above? Visit our page of Snap & Grow Products for more information. We offer a shade kit, shelving units, plant hanger clips, and more! Did you know Home Products 'N' More is a small, family owned and operated business? We have been doing business online since 1998, and we pride ourselves on providing good quality products at reasonable prices. Our goal is to give great customer service to each and every customer we interact with, so if you ever have a question or a concern, please don't hesitate to contact us. We're always happy to hear from you!